I get my ink supplies from a couple places. Online, I like US Litho Supply, although I generally don't buy enough to warrant placing an online order. I got my initial supply of Van Son rubber based ink, a gallon of California Wash, and a couple other supplies from there. If I need one color or one or two supplies quickly, I stop by my friendly neighborhood Kelly Paper or even friendlier Keldon Paper. My absolute favorite place to get ink, however, is my local ink supplier Accent Ink. They only do oil based inks, but I get all my metallic inks from Accent, as well as my clients' special order custom inks. As for first ink color, it might sound boring, but black is always a good place to start. Hope that helps! Yesterday while I was cleaning the press, one of the cats knocked over a bunch of paper and coasters I had been working on. This is par for the course with working at home. I keep the door open so the fumes don't accumulate, so the animals pretty much get to go wherever they want. So far, with one grand exception, there haven't been major problems. Today when I came in, I noticed that my jar of metallic silver was turned over, lid off, on my poor carpeted floor. I can only imagine that I didn't put the lid back on tight, and when a cat (I blame Jezebel) knocked it off my desk, the lid came off and well, there was a big pool of metallic silver ink on my light beige carpet. Now I know it's my own fault for putting these materials on carpet to begin with, but hey, the carpet was there already! Luckily I got it all out. Here's what I did. I first picked up what I could of the ink without spreading it even more. Then I used "Paint Clean Up" to get the bulk of the ink out of the carpet. With that done with it, I got out diluted California Wash, my steam cleaner (yes, I have a steam cleaner), and a bunch of carpet cleaning detergent. I filled up my steam cleaner with water and detergent, and, dousing the stain with the diluted California Wash, used the steam cleaner to clean the rest of the stain. Thank goodness! I was absolutely inspired on my trip through Asia. 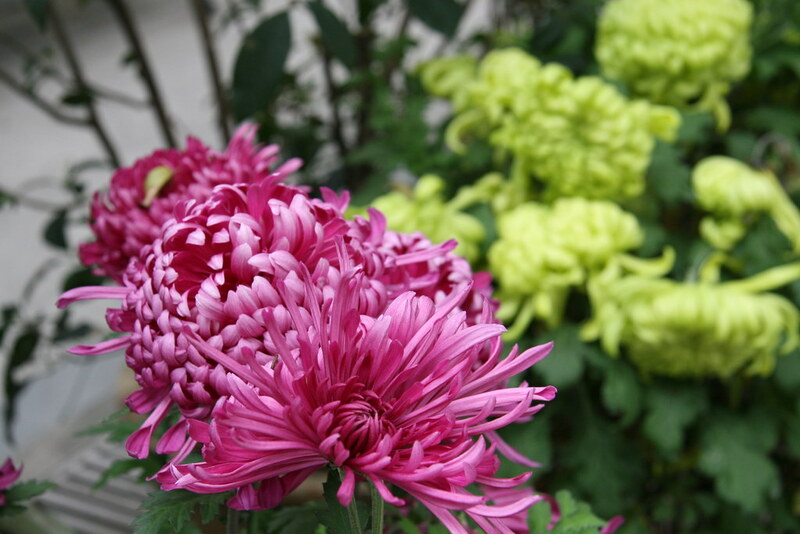 It was grey and misty most of the time, which made the pops of color all the more vibrant and beautiful. 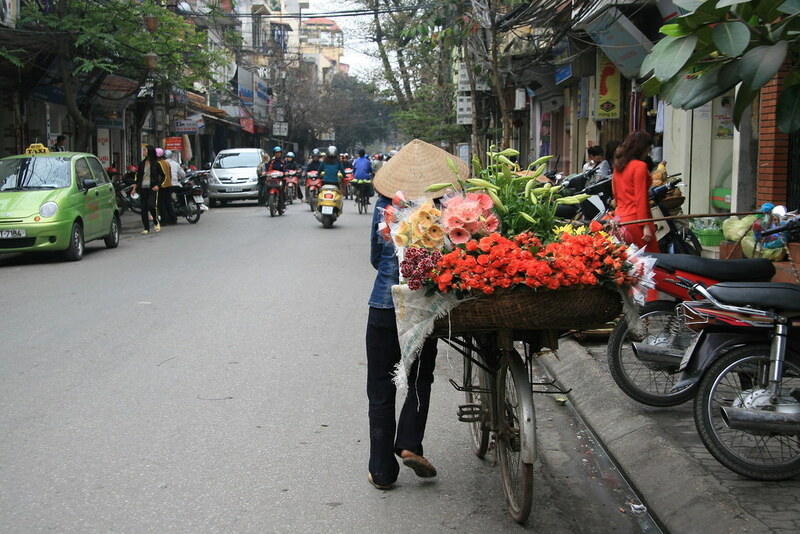 I especially loved these women bicycling their beautiful flowers through the street. So much to process still, and to translate -- somehow -- to my own art. The studio's been quiet for the last week as I have been traveling around Hong Kong and northern Vietnam. We're leaving tonight, and I've decided that I will have to come back to see the rest of the country. 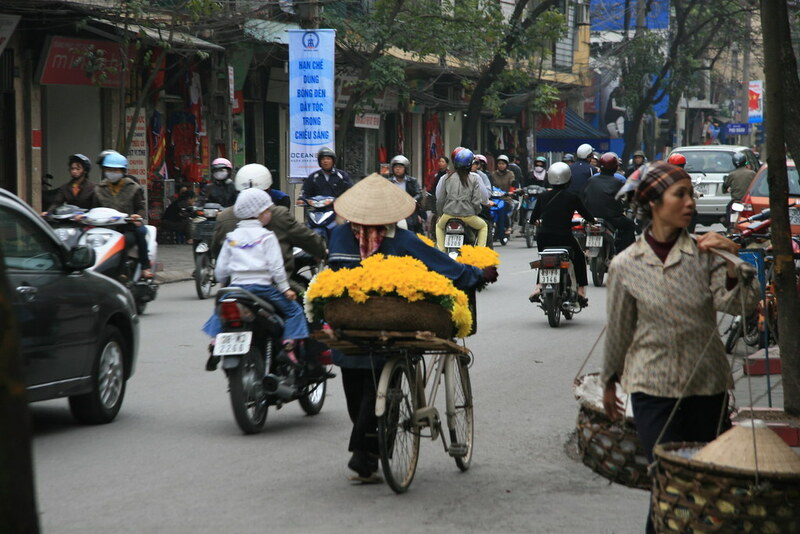 There's so much color and movement here, especially in Vietnam. I can't wait to share my design inspirations once I get back. I've been seriously using a bunch of bone folders and rulers to score and fold my cards. Yes, up until now, all cards were folded by hand with love. It's a brainless exercise, but rather time consuming and not much fun. I read awhile ago that letterpresses make the best scores out of any method, so I went ahead and got myself some scoring rule and a funky looking creasing matrix to go with it. For the longest time I've had a bunch of scoring rule and over 3 feet of creasing matrix for my press. I've honestly been a little afraid of the whole affair and so I hadn't done anything with it. My thought was to turn my tabletop press into a scoring press so I could just leave the creasing matrix channel on the tympan and score whenever I needed to. I never learned how to do this in my letterpress classes, and I was afraid of messing up perfectly good letterpress printed paper (and my press for that matter) trying this out. My friend Carrie did it on her Vandercook, though, so I saw no reason why I had to be so chicken about the whole affair. I finally bit the bullet yesterday and locked my scoring rule and creasing matrix into the chase of my Pearl yesterday, lined up my card as I would as if I were going to print, and scored over 600 cards in about an hour. Amazing. Perfect folds. No more broken fibers ruining the fold and perfectly good cards. I feel really silly now to have waited so long to do this. 2. Expose the adhesive backing on the creasing matrix. Run the press through one impression. The creasing matrix should now be attached to your tympan. 3. Remove the plastic lip that held your creasing matrix to your scoring rule. You should now have two raised plastic pieces that stick to your tympan and create a channel. 4. Align the paper as you normally would and run the press as you would as if you were printing the line (which, in essence, you are). 5. Voila! Perfectly scored paper! 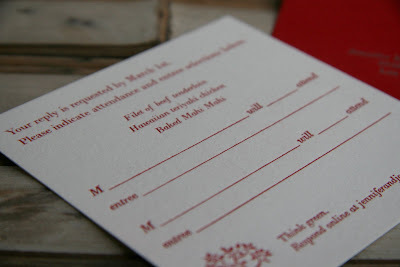 My friend Josiah designed these for his wedding, and I had the privilege of printing these square invitations and square response cards. 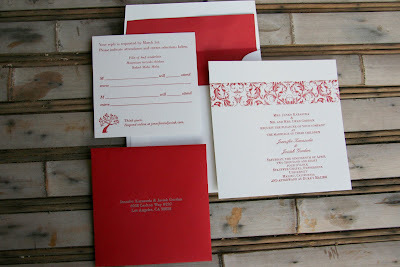 This is a simple wedding invitation suite, letterpress printed in lucky red. Congrats to Jennifer and Josiah! Wedding in Bloom -- Beautiful Peony Invites! 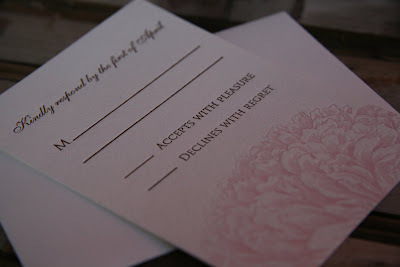 Usually I wait until after the wedding to share invitations that I've done, but these were too pretty! 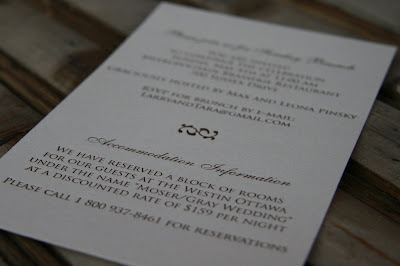 I had to share some pictures of the invitation suite. 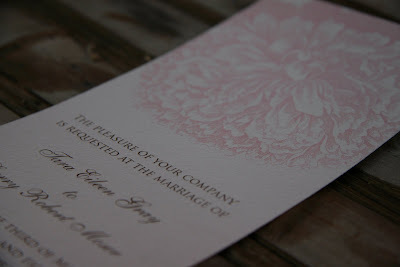 These custom letterpress invitations were done on a tea length card with a classic beautiful peony in bloom. 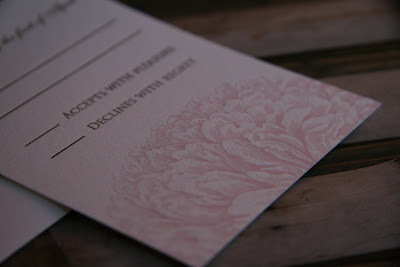 I especially love how the peony came out on the invitation and response card -- the peony petals have a great 3rd dimensional quality to it and it looks like the petals are trying to escape the paper. 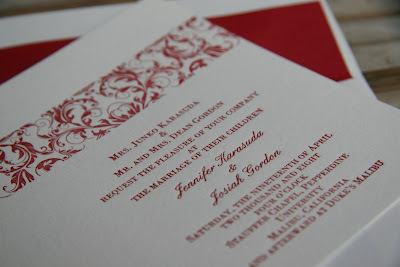 Just gorgeous with the letterpress.